Ellibelle's Corner: Love this color combo!! Hello and a happy monday. I hope you are having a great start of the week! This card was inspired by one of the cards on the front page of the new stampin up catalog. I just loved the color combo and will be using it again!! I found this image online, a freebie coloring page from Elizabeth O. Dulemba. Her art is just beautiful. Image was colored with copics and cut out. This little fairy actually sits on a stack of books but I cut it out without those books. Card stocks used are bermuda bay, crushed curry and soft suede. I used close to cocoa grosgrain ribbon and ink for sponging as I don't have any in-color inks. To finish off the card I did a little bit of paper piercing and added a few pearls, as well as stickles to the wings. The sentiment is from stampabilities. Thanks so much for visting my blog today, I'll be back again tomorrow with my Digital Tuesday Challenge card. Have a great Monday!! Beautiful card! I love how you have your little fairy "sitting" on the ribbon - adorable! Love this precious fairy perched so perfectly on your ribbon!! What a delightful card!!! Brings back reading fairy tales as a child . Wonderful card! Great coloring and accent! Blessings to you! Gorgeous card! Thank you for introducing me to another great digi artist! This is beautiful. I love her work. She is an amazing artist. Love you card and those colors. 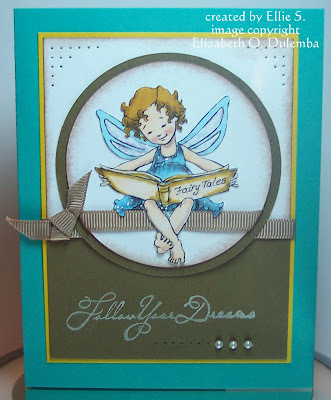 Such a cute little fairy and love that color combo too. Great layout to make this image the main focus. oh this is a gorgeous image and a gorgeous card! Wow beautiful card...the image is adorable.